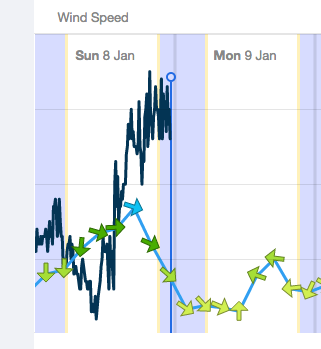 The blue line in the graphic below shows predicted wind speed at Dover for Sunday: up to 15 knots fresh. The black line shows actual: in the evening hovering around 30 to 35 knots. Cop that on the nose and you know you are alive, and things become very interesting indeed very quickly if mistakes are made or equipment fails.